The concern that men are up to something nefarious when in a clump, is understandable. Most of the mass destruction in the world by military, religious, governmental, and corporate idiocy was hatched by white guys gathered in some back room. And these decisions are often made by the most emotionally immature and psychologically unconscious of our species. The ascension to places of power in complex and impersonal bureaucracies often requires the ability to shut down any feeling in service of cold intellectual decision making. These hard-driving movers and shakers can be adept at looking good, acquiring wealth, lots of stuff, and saying things like, “I got this”, and “I’m not weak, I don’t need anybody”. Unfortunately, these guys need healing more than anyone. I’ve been working with emotionally wounded men for 25 years (which is most of us), and it’s the guys that are married to success and intellectual toughness that are the most dangerous to themselves and others. It usually takes a giant train wreck in their life to be open to inner work and a different kind of men’s gathering. After a particularly strong men’s retreat about a decade ago, a friend and I stood across from each other in an adjacent park sharing a tearful hand-on-each-others-heart connection (I know, it’s weird. But much of the work seems weird because we don’t have many healing rituals for men in our modern world). Suddenly, two cop cars came skidding in. They had been called to break up the fight. The neighbor who called and the officers who arrived could think of no other reason that men would be standing tall and facing each other! The major obstacle to overcome on the way to healing is not the cultural bias against men gathering together, but the internal terror that men carry about being seen as vulnerable. The wildly exaggerated fear that feelings and healing are related to homosexuality or being excessively feminine is rampant. My dad was clear and enthusiastic that I should never be a “limp wrist” or “act like a girl”. I was stiff as a board and robotic when I came into men’s healing work, and It took quite a while for me to loosen up and find a less rigid authentic carriage. We can argue for hours on Facebook about the leaders we think are incompetent, who may be coldly pursuing selfish pursuits. We could rail against corrupt politics and corporate greed. And/or, we can take our male selves, or our male partners to a men’s group or healing intensive. Read Iron John, by Robert Bly, or He, by Robert Johnson, or Fire in the Belly, by Sam Keen, or Daring Greatly, by Brene’ Brown. Most men see being strong and tough as the highest ideal. Well, sorry to be the one to tell you, but vulnerability takes much more courage than being shut down and distant. Further, it is among the highest factors that determine inspired followership in business (Beare, 2016). People may obey out of fear, but to instill trust, a crack in the armor has to happen. So, it is right to distrust what goes on when men gather. Traditionally, the good old wounded boys have cooked up some considerable destruction. But when it happens for healing purposes, and the work is facilitated with maturity and compassion, these men emerge as transformational leaders and healers. There is much evidence that these kind of intense healing experiences make significant positive change in the way men approach relationships (Burke et al, 2010). Remember, there is a mountain of internal and external misinformation and shame directed toward men and their emotional capacities. So, the choice to gather for healing must not only be tolerated, it must be seen as deep heroics and encouraged boldly. Burke, C. K., Maton, K. I., Mankowski, E. S., & Anderson, C. (2010). 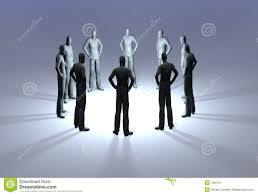 Healing men and community: Predictors of outcome in a men’s initiatory and support organization. American Journal of Community Psychology, 45(1-2), 186–200. Dr. Bob Beare is an organizational psychologist specializing in leadership development in Austin, TX. He runs men’s groups (current openings on Tuesdays at 6pm), is Founder of The Brave Heart Experience, a monthly 2 day men’s healing intensive, and Founder of Authentic Leadership, a development program for leadership teams.